The Best Calf Exercises are standing calf raises. There are a few different machines that you can use to strengthen your calf muscles, but standing calf raises are really the #1 calf exercise. 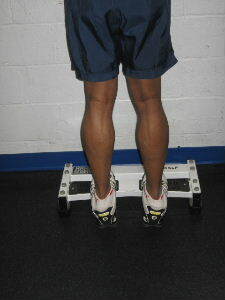 You can do standing calf raises on both legs or on 1 leg and each variation give you a slightly different feeling. This page has pictures of 2 leg calf raises on a step. Using a step or some type of elevated surface will give you additional range of motion and deliver better results. Starting Position: Simply stand on the end of a platform or step and allow your heel to lower towards the floor so that your calf muscles stretch. Form: Exhale and raise on to your tip toes. Hold for a brief second at the top of the range of motion and then slowly lower to the starting position. Personal Trainer Tips: Move in a slow and controlled manner to avoid using momentum. Make sure to use the full range of motion. Allow your heels to lower towards the floor to get a good stretch and make sure you push all the way up to the top of the range of motion also. This is a great exercise to strengthen the ankles, arches, and calf muscles. It is a great exercise for athletes, runners, and regular gym goers. The calf is often neglected, but it really supports the entire lower body. 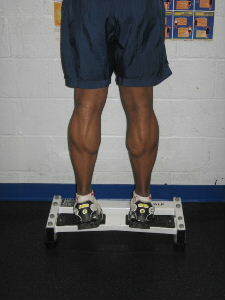 If you feel that 2 leg calf raises are too easy, try progressing to 1 leg calf raises.